THE RAVENNA HOUSE Well hello good people. This week I want to talk backslash. 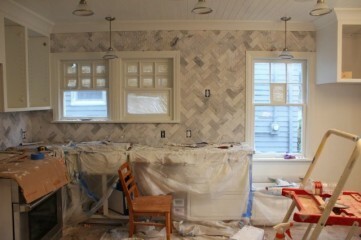 Marble herringbone tile backsplash, to be precise. And Downton Abbey. But I'll get to that in a bit. The backsplash still awaits grout and someone's got to pick those tiles spacers out (read: me), but even in it's current state, I love it. I'm obsessed with the subtle pattern of the marble and how the window trim and crown molding seem to pop out of the wall. It's classic and downright pretty. Then I watched Downton Abbey's Season 4 finale. (Have you seen it? Well don't spoil the end - I've still got another 30 minutes to watch!) There are all of those beautiful pastel dresses, veils, and flowers at Rose's presentation ball. And I got to thinking...is my kitchen going to look just like a twentieth century teenage girl's coming out party? Soft palette. Check. Feminine feel. Check. Shiny accessories. Check, check, check! Let's recap. This kitchen has white cabinets, marble countertops, marble backsplash, shinny stainless steel appliances, frosted lights, and a cream capiz chandelier. Have I designed the ultimate feminine kitchen? 1. Hubby likes the kitchen. He thinks the tiles are cool. Plus, according to him, I live with 3 males (if you count the dog) and there should be one room in our house thats all woman. 2. Women buy houses. At least that's what I've always heard and it certainly works that way for us. Women see the house, fall in the love with the house, and launch an all out campaign until their Hubby agrees to buy that house. So a kitchen that's on the feminine side could work in our favor, if we ever decide to sell this house. At least that's my theory and I'm sticking to it. Besides the women at Downton never minded a little bit of feminine grandeur! What do you think? Do you like the backsplash? Is it too feminine for you? p.s. I lOVE this life-advice wrapped up under the guise of money-saving-tips article on Oh Dear Drea (here). p.p.s. Baby Wilder (eight months) wanted to make a guest appearance this week. And who am I to stand in his way. He's got a mind of his own, that one!